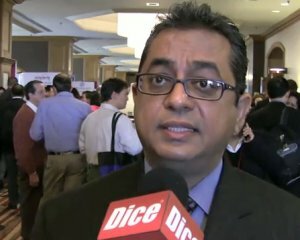 CIOs need more staff, or versatilists, says Sanjog Aul, host of CIO Talk Radio. Because of the past economic downturn, they’ve have been holding back. But now that they’re seeing a release in funding, they’re opening the gates. The newer generation of IT professionals don’t stick around for long, Aul observes. If you can keep them in the organization–and challenged–for two years, then that’s an accomplishment. And corporations need people to stay around longer. The business knowledge will disappear as the baby boomers retire. If they don’t hire enough people by 2015, retired baby boomers will have to be brought back as consultants to fill the information void. How do the CIOs define “versatile tech worker”? Is that phrase synonymous with “IT generalist”? Good question. You may have caught him in one of those CIO “I want everything” comments.